Next spring, the beloved "tale as old as time" Beauty and the Beast will come back to the big screen with a new live action adaptation from Disney, which has been given a March 17, 2017 release date. We haven't seen or heard much about this highly-anticipated project in months, but that all changed today, with a brief video teasing that the first trailer will debut tomorrow morning on ABC's Good Morning America. Unfortunately, this trailer preview doesn't reveal any actual footage, but we'll get to see our first look at this adaptation soon enough. Disney will release Beauty and the Beast in 3D on March 17, 2017. The beloved tale will be retold for the big screen with a modern live-action lens and the help of transformative CG magic. Emma Watson and Dan Stevens will star as Belle and the Beast/Prince respectively, and Luke Evans will play the role of Gaston. Emma Thompson has joined the cast as Mrs. Potts and Kevin Kline as Belle's father, Maurice. This new trailer preview from the Beauty and the Beast Twitter page doesn't reveal exactly when during Good Morning America the trailer will debut, but stay tuned. The supporting cast includes Ewan McGregor as Lumiere, Gugu Mbatha-Raw as Plumette, Ian McKellen as Cogsworth, Josh Gad as LeFou and Stanley Tucci as Cadenza. This live action adventure is based on the classic French tale centering on Belle, whose father is taken captive by the Beast after being lost in the woods. The young woman agrees to trade her life for her fathers and ends up falling in love with him. This releases a witch's curse on the Beast, which turned him into the monster. Eight-time Oscar-winner Alan Menken, who won two Academy Awards for the 1991 animated classic, will score the film, which will feature new recordings of the original songs in addition to several new songs written by Menken and Sir Tim Rice. Bill Condon will direct from a script by Stephen Chbosky, and the film will be produced by Mandeville Films' David Hoberman and Todd Lieberman. Production got under way last May at Shepperton Studios in London. 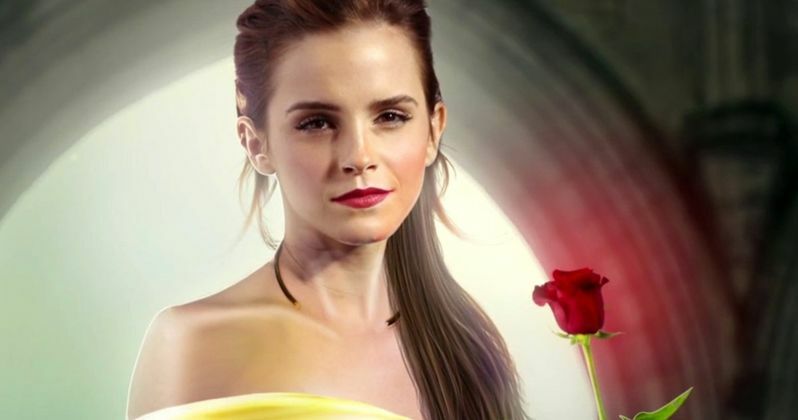 Beauty and the Beast will be going up against Sony's action-comedy Baby Driver from director Edgar Wright when it hits theaters on March 17, 2017. The live action adaptation is also sandwiched between a number of high-profile releases, with Kong: Skull Island and The Boss Baby arriving a week earlier on March 10, 2017, and Knights of the Roundtable: King Arthur and Power Rangers arriving on March 24. Be sure to check back tomorrow for the first full trailer for Beauty and the Beast, but until then, take a look at this preview below.